The last man to score a winning goal for Motherwell in a Scottish Cup final reckons current striker Curtis Main can be his 2018 version. Stevie Kirk – who famously netted in every round as the Steelmen roared to glory in 1991 – thinks Main has the qualities to sink Celtic in this year’s final at Hampden Park today (kick-off 3pm). “Curtis Main is a big player for Motherwell,” the man nicknamed The White Pele told the Motherwell Times. “He has quite good pace and he is very strong and not bad in the air. “The one thing I didn’t have was pace but I had a really good first touch and I was really good in the air. “So in those ways I think we are very similar. Kirkcaldy-born Kirk (55), who scored the winner in the thrilling 4-3 final win over Dundee United 27 years ago, also reckons Main’s strike partner Ryan Bowman and midfielders Chris Cadden and Carl McHugh have the tools to hurt Celtic. “Bowman is a threat because he is magnificent in the air,” Kirk added. “He has a real presence and is liable to get on the end of anything that comes into the box. “Cadden has great pace, the ability to drift past people, two good feet and he can finish. “His dad Stephen was a team-mate of mine at Motherwell. “McHugh is also a big player for the team. Kirk, who scored 63 goals for Motherwell in 301 appearances between 1986 and ’95, reckons the Steelmen face an extremely tough test to beat a Celtic team going for a second consecutive treble. 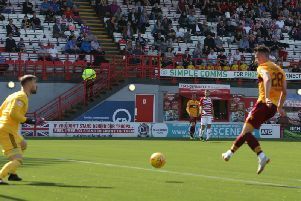 “Motherwell will have to be at their very best to beat Celtic,” he said. “The biggest problem will be trying to silence the crowd, because it will be a 75/25 split in Celtic’s favour. “Hampden is a noisy place at the best of times and they are going for a treble so the place will be bouncing. “Celtic’s strengths are that they have great all round ability, they pass the ball well, run the ball well and can score from anywhere. “The bottom line is they don’t lose games. That’s their real strength. “If Motherwell win the cup then they are doing it against the odds again. Kirk described Motherwell’s 1991 cup winning manager Tommy McLean as “tactically brilliant”. The legendary striker also hailed the job being done by current gaffer Stephen Robinson, who has led the men in claret and amber to two cup finals in the same season. “Tommy knew more about the opposition than he did about us,” Kirk said. “It was him that guided us to that cup victory. “I think Robinson has done very well, two finals in one season so the fans should be happy with that. Motherwell return to Hampden a month after their comfortable 3-0 win over Aberdeen in the semi-final.